Banking on our enriched industry experience, we are engaged in offering a huge gamut of Chinese Burner Gas Stove. 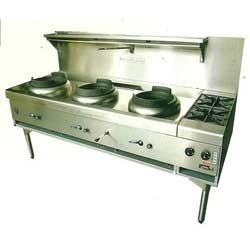 We offer a wide range ofChinese cooking range with four burners. The Chinese range has a stainless steel front landing with fine finish. It is provided with high back splash and a pipe rack. The top of the Chinese range is water cooled and built in drain system that controls the stove temperatures. Looking for Chinese Burner Gas Range ?